There’s plenty of time to make a new top for spring! Mesa works up delightfully quick in this pretty scoop neck summer top with lace edgings at hem and cuffs and princess waist shaping for a flattering fit. I love the lace detailing! So pretty! Greetings Rachel. 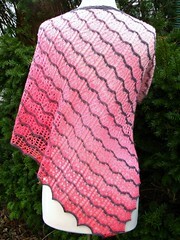 Just got Patternworks catalog and your CEY Sunburst shawl I’d featured on page 6. Was thinking of you this morning and hoping your talk goes well. See you Friday night!!! Cool! Can you bring the catalog? I’d love to see it.